﻿The apartments are situated in the 9th district, in the central quarter of Budapest, in a modern residential house in the quiet Erkel Street which ends in the bohemian Raday Street. Your comfort and safety is supported by the 24-hour reception and the elevator in the house. Our cozy, new apartments vary from 30 to 60 square meters, are well furnished and equipped. The apartments have cable television. Smaller apartments have shower, larger bathtubes, all have washing machine, hairdryer, iron, ironing board, towels and sheets. By need, we also provide you internet access. Garage is located under the building, where parking place can be provided, for 10 EUR per day. Breakfast is provided by the adjacent Marie Kristensen Sandwich Bar with its delicious sandwiches, salads and pancakes for our guests. You can check their menu on the following link or can be found in printed form in the apartments. 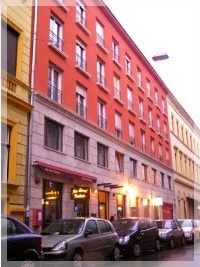 Budapest Central Apartments is a great choice for business or vacation trip as well. We are waiting for our guests all year round! PLan your Budapest visit at our apartments, you won’t regret it!